U.S. sanctions would severely stymie the above projects and investments. Although these sanctions are unilateral sanctions, imposed by Washington alone, the Trump administration has made it clear that no company or country dealing with Iran would be given access to the U.S. financial and banking system. More than 80 percent of India’s oil is imported through foreign tankers, thereby making India’s energy security contingent upon the U.S. sanctions. Similarly, the sanctions would impact investments in Chabahar as well as Farzad and South Pars oil field. Foreign companies and even Indian multinational companies with operations in the United States or dependent on the American financial system are planning to withdraw operations from Iran with the advent of sanctions. The State Bank of India has already announced it will suspend payment operations in Iran starting from November. Reliance Industries Limited (RIL) too has decided to halt its oil imports from Iran. In the past, India was able to successfully negotiate waivers pertaining to Iran from the United States. The previous Obama administration maintained sanctions on Iran but granted waivers to India. Now, New Delhi aims for an arrangement of the same kind with the Trump administration. At a time when both India and the United States want to forge a strong relationship, diplomatic dexterity should be prioritized over transactional orthodoxy. 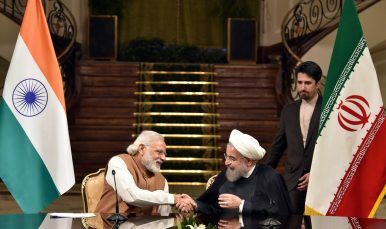 Iran shouldn’t be allowed to be the third wheel in India-U.S. relations. However, there is more at stake for India than its relationship to Washington. In addition to the above complexities, India needs to maintain the fragile Shia-Sunni balance while simultaneously factoring in the concerns of Iran’s rival Gulf nations like Saudi Arabia and the UAE. Besides oil, these countries have a huge Indian diaspora and are also the largest source of remittances (accounting for approximately 36 percent of the total India receives). There have been already attempts by Saudi Arabia and UAE to entice India. Companies like Saudi Aramco and Abu Dhabi National Company (ADNOC) have promised to invest $44 billion — roughly amounting to a 50 percent stake — in Ratnagiri Refinery and Petrochemical Limited (RRPCL). However, the actual materialization of these deals needs to be assessed carefully before taking any decision. India should also pay attention to the Chinese dimension. The renewed U.S. sanctions would force Iran to drift sharply toward non-Western powers like Russia and more so toward China. Chinese officials often characterize the relationship with Iran as “20 centuries of cooperation” and Beijing has shown no intention to scale down those ties. Iran, owing to its geography, plays a crucial role in China’s Belt and Road Initiative (BRI). China could leverage this as an opportunity to further consolidate its hold. There is a possibility of a petrol yuan emerging, with China using its renminbi in transaction with Iran, an important step toward the internationalization of the Chinese currency. China-Iran engagement will undermine the impact of U.S. sanctions and put Beijing on the higher ground vis-a-vis countries like India and the United States. Thus, India needs to carefully asses these situations while formulating its response. India should strongly argue for waivers regarding oil trade (given Iran’s importance to Indian energy security) and critical projects like Chabahar port. The absence of Iranian oil could shoot up prices in the oil market, subsequently raising India’s import bill; with elections around the corner, a hike in oil prices could mean tough times for the Modi government. India can contemplate lowering tariffs for U.S. goods in exchange for a sanctions waiver. New Delhi also needs to strongly push for Chabahar and frame it in tandem with Trump’s objectives in Afghanistan – the port would reduce Afghanistan’s dependence on Pakistan and would allow India to engage more constructively in the region. India should negotiate with Iran for a rupee-rial system and efforts should be made to revive Irano-Hind, a jointly owned shipping company that was shut down in 2013. Further, India should coordinate with EU countries along with Russia and China to promote the Iran nuclear deal or any alternative arrangement, in case the United States remains firm on sanctions. India needs to do a holistic assessment of the situation and not tie itself to any particular country. Paras Ratna is a postgraduate from Tata Institute of Social Sciences and is currently working as Project Executive, strategic affairs at Vision India Foundation.